AFCI (Arc Fault Circuit Interrupter) - United Electrical Contractors, Inc. The “AFCI” is an arc fault circuit interrupter. AFCIs are newly-developed electrical devices designed to protect against fires caused by arcing faults in the home electrical wiring. Annually, over 40,000 fires are attributed to home electrical wiring. These fires result in over 350 deaths and over 1,400 injuries each year(1). Arcing faults are one of the major causes of these fires. When unwanted arcing occurs, it generates high temperatures that can ignite nearby combustibles such as wood, paper, and carpets. The AFCI circuitry continuously monitors current flow through the AFCI. AFCIs use unique current sensing circuitry to discriminate between normal and unwanted arcing conditions. Once an unwanted arcing condition is detected, the control circuitry in theAFCI trips the internal contacts, thus de-energizing the circuit and reducing the potential for a fire to occur. An AFCI should not trip during normal arcing conditions, which can occur when a switch is opened or a plug is pulled from a receptacle. Presently, AFCIs are designed into conventional circuit breakers combining traditional overload and short-circuit protection with arc fault protection. AFCI circuit breakers (AFCIs) have a test button and look similar to ground fault circuit interrupter (GFCI) circuit breakers. Some designs combine GFCI and AFCI protection. Additional AFCI design configurations are anticipated in the near future. It is important to note that AFCIs are designed to mitigate the effects of arcing faults but cannot eliminate them completely. In some cases, the initial arc may cause ignition prior to detection and circuit interruption by the AFCI. 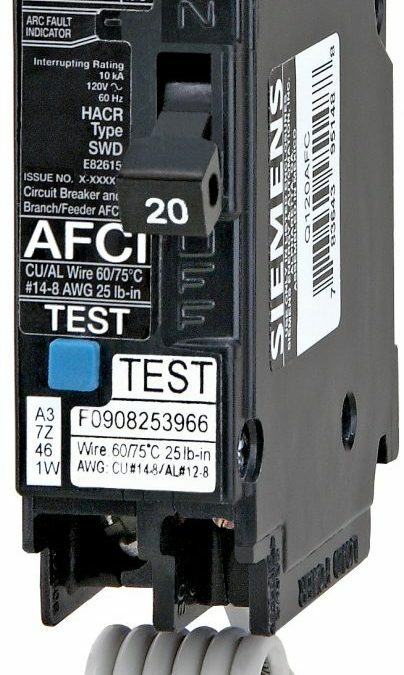 The AFCI circuit breaker serves a dual purpose – not only will it shut off electricity in the event of an “arcing fault”, but it will also trip when a short circuit or an overload occurs. The AFCI circuit breaker provides protection for the branch circuit wiring and limited protection for power cords and extension cords. Single-pole, 15- and 20- ampere AFCI circuit breakers are presently available. The 1999 edition of the National Electrical Code, the model code for electrical wiring adopted by many local jurisdictions, requires AFCIs for receptacle outlets in bedrooms, effective January 1, 2002. Although the requirement is limited to only certain circuits in new residential construction, AFCIs should be considered for added protection in other circuits and for existing homes as well. Older homes with aging and deteriorating wiring systems can especially benefit from the added protection of AFCIs. AFCIs should also be considered whenever adding or upgrading a panel box while using existing branch circuit conductors. AFCI circuit breakers should be installed by a qualified electrician. The installer should follow the instructions accompanying the device and the panel box. In homes equipped with conventional circuit breakers rather than fuses, an AFCI circuit breaker may be installed in the panel box in place of the conventional circuit breaker to add arc protection to a branch circuit. Homes with fuses are limited to receptacle or portable-type AFCIs, which are expected to be available in the near future, or AFCI circuit breakers can be added in separate panel boxes next to the fuse panel box. A test button is located on the front of the device. The user should follow the instructions accompanying the device. If the device does not trip when tested, the AFCI is defective and should be replaced.